The Bullet train is an often talked about thing these days, for good reasons too. Officially known in Japan as the Shinkansen, meaning “New Trunk Line”, the Bullet Train got this name because of the shape of the train which initially resembled that of a bullet. Of course, there are many detractors, all with pointless reasons to oppose the project. Some say it is financially nonviable, some say that it is redundant in the age of air travel, some say it will be expensive to travel on. Let’s just go thru the Shinkansen that operates in Japan, and compare it with India. Proposals for high speed rail had been going on since the 1930s. Prior to the Shinkansen, Japan’s rail system consisted of 1067mm Narrow Gauge railway lines which took roundabout routes due to difficult terrain. In 1957, the 3000 Series SE Romancecar, capable of attaining a record breaking high speed of 145km/hr for Narrow Gauge was introduced. Banking on the success of an NG train achieving such speeds, Japan decided to build a High Speed Rail system that would run on a 1435mm Standard Gauge track. With Government sanctions secured in the end of 1958, Construction began at the end of the first quarter of the following year [April 1959]. The cost then was estimated to be ¥200billion, which came in the form of Government loans, Railway Bonds, and a low-interest World Bank loan of $80million. The 550km line from Tokyo to Osaka was thrown open in October 1964 for the General Public, just before the Tokyo Olympics. The existing Limited Express train covered the distance in 6hours and 40 mins. 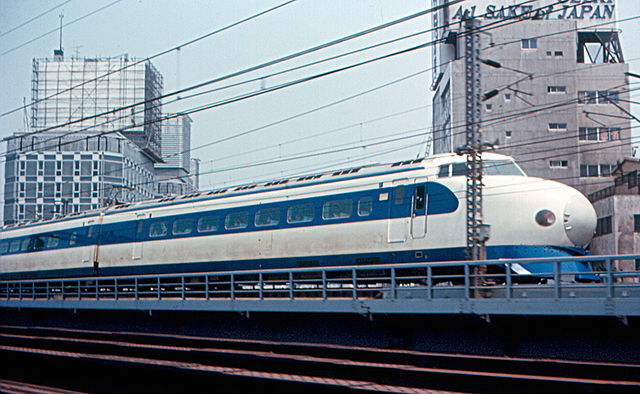 At 210 km/hr, the Shinkansen took four hours for the same, a journey which then took 3hours by 1965 thanks to increased speeds. Today, the line is capable of handling a high speed of 285km/hr, thereby reducing the journey time between the two cities to 2hours and 22minutes! The fare from Tokyo to Shin-Osaka is ¥14,104 for adults on the Hikari and Kodoma services, and ¥14,450 on the faster Nozomi service. This translates to roughly ₹7715 and ₹7,911 respectively which works out to an average of 25 yen per kilometre, or 14 rupees per kilometre. Now what does the Shinkansen have that makes it so fast? All Shinkansen tracks, while at grade for most part, do not have any crossings with roads. They are completely grade separated, have tunnels and bridges thru obstacles and rough terrain, and are cut off from the regular tracks. This means, that slow trains, freight trains, all have no impact on the Shinkansen. This would make it a super win-win situation in Mumbai itself because of the severe congestion on the Western Railway network. Shinkansen track at Toyohashi station. Image copyright Tennen-Gas, CC-BY-SA 3.0 Unported, available on the Wikimedia Commons. Shinkansen tracks are 1435mm wide in comparison to the Japanese Narrow Gauge of 1067mm. India traditionally uses 1676mm Broad Gauge on Indian Railways. Metre Gauge tracks of 1000mm width are slowly being phased out in favour of Broad Gauge, also known as Indian Gauge. Line 1 of the Kolkata Metro and the Red, Yellow and Blue Lines of the Delhi Metro are rapid transit systems in India that run on Broad Gauge, while all other Rapid Transit Systems use the 1435mm Standard Gauge. The Shinkansen network uses a combination of both ballasted as well as ballastless tracks, with the latter being used in sections such as viaducts and tunnels. Automatic Signalling is used. All operations are automated at a Central Control Room, eliminating trackside signals that are used conventionally. As of now, advanced signalling is only used on Metro corridors in India. The Shinkansen operates on a 25kiloVolt Alternating Current system of electrification. This is the same as Indian Railways and most Metro Railway projects, thus making it the simplest of Shinkansen features to implement in India. All trains are Electrical Multiple Units [EMUs]. They are lightweight and air-sealed for greater speeds and stability. All axles are powered in the train, enabling higher acceleration and lesser time wastage during stoppages. 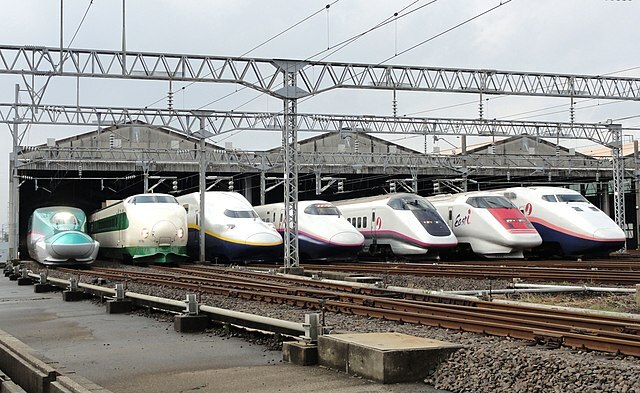 JR East Shinkansen Lineup at Niigata. Image copyright Rsa, CC-BY-SA 3.0 Unported, available on the Wikimedia Commons. Mumbai is situated at an altitude of 14m above mean sea level, while Ahmedabad is located at 54m. Between the two cities, there is no rough terrain, but a simple incline. Rivers on this route include the Ulhas River, the Narmada, the Tapi, the Mahi and the Sabarmati. Major cities on the route, not counting the fact that the Southern termini is the Financial Capital of India, include Surat, India’s Diamond Hub and Vadodara. The distance between Mumbai Central and Ahmedabad Junction is 493km, and presently takes 6 hours 25 minutes at a cost of ₹1000 for an AC chair car and ₹1900 in an AC Executive Chair Car in the fastest train on the route – The Shatabdi Express. Between Mumbai Central and Borivali, it runs slower than a Fast Local, taking 29 minutes for the journey, while a local takes 27 minutes, mainly due to congestion on the network. There are around 70 trains on this route at present. The High-Speed Rail corridor will be 508km long and will feature a 21km undersea tunnel North of the Thane Creek towards Virar before coming back up and continuing elevated. The impact of this line is something most detractors fail to see. Critics say that the line is being favoured because the Prime Minister and Railway Minister hail from these two states. What they forget is that Mumbai to Ahmedabad is among the highest density corridors of passenger transport in a day. Apart from this, this route is part of the Delhi-Mumbai Industrial Corridor. The Government must seriously consider the extension of this line from Mumbai to Pune as well, thus connecting the two most important cities of both Maharashtra and Gujarat. Further, the feasibility study has recommended that fares along this route should be the 1.5 times First Class AC fares, which is approximately ₹2200 right now on the Mumbai-Ahmedabad Duronto Express. This is quite reasonable for the distance, given the time it achieves this in. In comparison, taking Private Metro Lines into consideration; we see that the two most expensive lines are Mumbai Metro 1, which charges ₹45 for 11km, Rapid Metro Gurgaon, which charges a ₹20 flat fare for 5km. It is obvious that the High Speed Rail will cost less than most skeptics assume. A study by IIM-Bangalore has come to the conclusion that in order to break even and prepay loans, the train would have to carry 88,000 to 118,000 passengers per day, at an approximate travel cost of ₹5 per km per passenger. This, with a little extra calculations, results in a single one way journey coming up to ~₹2600. A while ago, Delhi Chief Minister, Arvind Kejriwal, the man who came up with the brilliant Odd-Even formula for Delhi, estimated that it would cost ₹75,000 for a one-way ticket for this journey, one which multiple people have tried to justify from an economic viewpoint on Quora. Both are wrong, for reasons known to all. For starters, Kejriwal is the CM of Delhi, not Maharashtra or Gujarat, where the line is to come up, nor is he the Railway Minister or an Economist. Two, the deal that Japan and India have agreed to is not what everyone is using for their calculations. Japan is giving India a loan of ₹79,000crore at an interest rate of 0.1%, with India having to pay back this loan over a 50 year period with a 15 year moratorium prior to that. In common language, India starts paying the loan back 15 years after the loan period begins. This is cheaper than the Delhi Metro’s JICA loan. A propaganda article by Troll.in, sometimes masquerading as Scroll.in calls it a Wasteful Expenditure. Why? It fails to mention that the money will be spent over 7 years, and not one year as the article claims. As stated, haters will continue to hate, in spite this particular corridor having been sanctioned by the previous government. 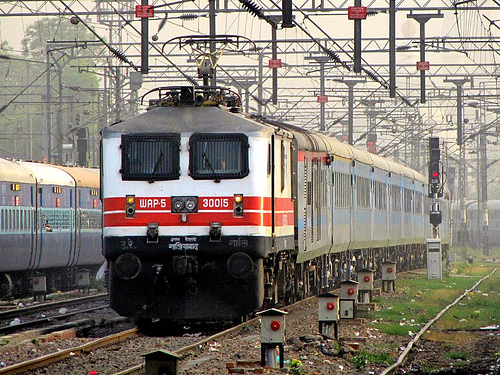 The Bhopal Shatabdi Express, with LHB Coaches, is the fastest train in India with a top speed of 150km/hr. Image copyright Ayushrocks, Public Domain. This is an often asked question. People ask, why not improve the existing rail network? Simple, Japan is offering the loan for export of the Shinkansen ONLY. It will also transfer some Technology to us so that we can use it for future lines. This money cannot be used for any other purpose. This does not meant that the Conventional Railway Network will take a backseat or be discontinued. It just means both will coexist. Like a Bus Transport company has Regular and AC services. But then, why not Maglev? Shanghai Maglev Train. Image copyright JakeLM, CC-BY-SA 2.5 Generic, available on the Wikimedia Commons. Another often asked question here is: Why not Magnetic Levitation aka Maglev, which offers speeds of upto 431km/hr against the Shinkansen high speed of 320km/hr? China uses a Maglev in in Shanghai. The line is a completely elevated one connecting the city and its airport. In a Maglev, the tracks are designed in such a manner that the train glides over it. Thus, the entire system is automated and both the tracks and the train itself are run by Computers. The Shanghai Transrapid was built by many companies. The tracks were built by local Chinese firms, while the train itself is German, having been built by ThyssenKrupp and Siemens. Cost of investment is high, as high or higher than the Shinkansen, but not at the same cost of the Shinkansen, keeping in mind the loan and the associated conditions. The Bullet Train between Mumbai and Ahmedabad is crucial for the Nation. It would help in redrawing the lifestyle and work culture of India, as well as restructure Western India as a transport hub. The biggest beneficiary of this would be Diamond Merchants in Surat, and along with that, the Smart City projects of GIFT City, DREAM City, and the Dholera SEZ. Also Read: What The Mumbai-Ahmedabad Bullet Train Means For The Region on Swarajya. Hang Me, Oh Hang Me! Odd or Even? Why the Delhi plan is the dumbest thing ever! Kejriwal’s jealousy stems out of the fact that this line doesn’t touch Dehli where he could fool Innocent voters into believing that he was responsible for it. If ever, god forbid, there was to be an accident on the MUM-AMD line, expect the shameless Muffler Man to blame the lack of track-side signals for it. Now the Honourable former Rail Mantri, LaaLOO of Chara Ghotala fame, has said ‘Why waste Money on Bullet train when you can feed to poor’. By Poor, did he refer to himself and by feed, did he mean Fodder? The BJP comes to power in Uttar Pradesh in 2017. The GoI announces a High-Speed Rail corridor from Meerut to Jaipur, via Ghaziabad, NOIDA, Faridabad, and Gurgaon, touching UP and Haryana, but completely avoiding the NCT. The line is sanctioned and awarded, with both states [BJP-led] supporting it. Trolling the NCT. Like it is meant to be trolled. It would be great to see this project being extended to Blore and Delhi. That’s when I feel it would really work. Well written, Srikant. The problem as usual is that most detractors know little about the project, technology or the financials, however, will keep spouting their nonsense. Keep up the good work.